Phoenix Wright: Ace Attorney - Trials & Tribulations (逆転裁判3 Gyakuten Saiban 3 lit. Turnabout Trial 3 in Japan) is a point-and-click adventure video game developed and published by Capcom for the Nintendo DS originally for the Game Boy Advance. 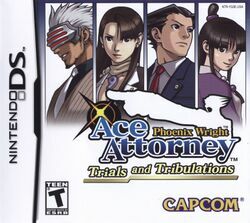 It is the third game of the Ace Attorney franchise, and the last to feature Phoenix Wright as the protagonist until the release of Dual Destinies in 2013. Trials and Tribulations features five brand-new cases, and new characters. This page was last edited on 20 March 2018, at 01:25. This page has been accessed 681,163 times.